July 2012 – Concurrent Technologies announces the release of the latest addition to their range of MicroTCA® development systems. 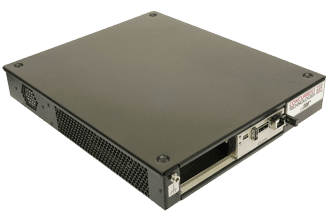 The SY AMC/235 is a free-standing 6 slot, single-width AdvancedMC™ (AMC) development system designed to fast track application development. 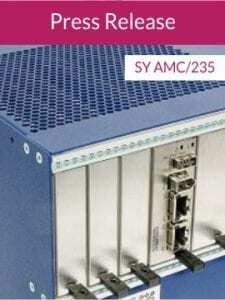 To enable rapid development the SY AMC/235 comes pre-installed with a dual core processor SBC currently supporting the 2nd and 3rd generation Intel®Core™ i7 processor with integrated high performance graphics, an 8 Gbyte SATA flash drive, a MicroTCA® Carrier Hub (MCH) and an optional Mass Storage AMC. The SY AMC/235 is based on an EMC enclosure, incorporating an integrated power supply and cooling fans, providing the user with a total of 6 slots: one slot is reserved for the MicroTCA® Carrier Hub (MCH); one slot is reserved for the system controller SBC; one slot supports an optional Mass Storage AMC. The remaining single-width slots can be populated with either 2 full-height or 3 mid-height AMC modules for system expansion. The backplane connects each of the 5 slots with the MCH via a PCI Express® (PCIe) fat pipe on the data plane and two 1000 Base-BX (SerDes) links on the control plane. Typical applications for MicroTCA® systems are telecommunications, security, defense, image-processing, process-control and medical markets. 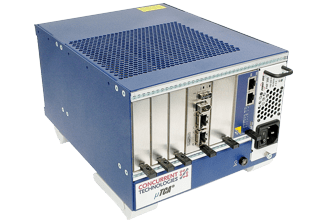 Concurrent Technologies provides a range of additional AMC™ modules to further enable customization of the SY AMC/235 development system – including SBCs, Graphics Adapters and Mass Storage solutions.